DEBATE: What Is the Best Way to Deal with North Korea? Home » Online Debates » DEBATE: What Is the Best Way to Deal with North Korea? Q: A few weeks after the visit of US President Donald Trump to Asia, North Korea is continuing with its missile launches. While the military option is openly on Washington’s agenda, a potential diplomatic solution cannot be excluded. BESA is joining the debate by asking experts: What is the best way to deal with North Korea? With its latest ICBM test on November 28, North Korea is on the cusp of achieving the capability to attack the United States with nuclear-armed, long-range missiles. After the test, Kim Jung-un declared that “we have finally realized the great historic cause of completing the state nuclear force.” A few days later, Pyongyang hosted UN Undersecretary General for Political Affairs Jeffery Feltman for talks with senior North Korea officials. The Trump administration should move quickly to exploit these developments by proposing to begin US-DPRK talks on the basis of a joint freeze: if North Korea halts additional missile and nuclear testing, the US will halt additional UN Security Council sanctions beyond those already in place. If Pyongyang rejects this offer and resumes testing, Washington will be in a stronger position to convince Beijing and Moscow to impose further UN sanctions, such as a full oil embargo on North Korea. If Pyongyang accepts the proposal, US and North Korean negotiators can begin talks on a broad agenda, including denuclearization and tension reduction. In truth, such talks are very unlikely to produce a comprehensive and permanent agreement. Nonetheless, even partial and temporary agreements to constrain and delay North Korea’s nuclear and missile activities are valuable. In the meantime, the US and its allies should focus on enhancing deterrence and missile defense capabilities, including boost-phase missile defense options, which are essential to managing the risk of a nuclear-armed North Korea. The North Korean threat is entering a new stage with repeated provocations via nuclear and missile testing. Three things are critical to meeting this challenge. First and foremost, we need to innovate our alliance management. Our strategic goal will be met most effectively by coordinated efforts among Washington D.C., Seoul, and Tokyo. The key here is to reconfirm the credibility of US-led extended deterrence, both conventional and nuclear, in northeast Asia. Second, we need to innovate our understanding of deterrence. The traditional approach is to combine two elements;i.e., deterrence by punishment and deterrence by denial. In our region, the former has been symbolized by the “swords” of US retaliatory strikes; the latter by “shields” provided by missile defense in the region. Are we successfully deterring North Korea in this context? So far, yes, definitely – but we should admit that the regional security environment has gotten worse. Then, we should ask ourselves, “what should be done?” North Korean provocations this year have been extremely intimidating, but have not brought about any casualties or physical destruction. These challenges in the “grey zone” necessitate a new look at our deterrence posture, which highlights a new element of “escalation dominance.” Similar to NATO’s emphasis on enhanced forward readiness, we are operationalizing “Flexible Deterrent Options” by boosting military exercises and high-level policy consultation in our region. The Heritage Foundation, Washington D.C.
North Korea’s proximity to crossing the ICBM threshold has triggered greater advocacy for a US preventive military attack to keep Pyongyang from attaining its objective. But intercepting missile test flights that do not clearly pose a security threat, or military strikes on North Korean soil, risk triggering an all-out war with catastrophic consequences. While the US should be steadfast in its defense of its territory and its allies, it should refrain from bellicose threats of preventive military strikes and save preemptive attack for indications of an imminent North Korean strike. Some advocate diplomatic reengagement, but Washington should reject such calls for a premature return to negotiations. Numerous previous North Korean agreements pledging to never develop nuclear weapons, and subsequent promises to abandon those weapons, all failed. There is little utility to such negotiations as long as Pyongyang rejects the core premise of abandoning its nuclear weapons and programs. The best way to engage in negotiations is after a comprehensive, rigorous, and sustained international pressure strategy. If the US is serious about going after North Korea’s nuclear and missile programs and those who assist it, Washington will have to mount a more sustained and committed sanctions campaign. North Korea must be held accountable for its actions. To refrain from doing so is to condone illegal, give de facto immunity from US and international law, and undermine UN resolutions. To head off a disastrous confrontation with North Korea, Washington needs to communicate to Pyongyang that a diplomatic off ramp from the collision course we’re currently on is not only possible but preferred. Initiating bilateral “talks about talks” without preconditions is the first step. The goal of denuclearization should remain the long-term objective, but it needs to be set aside for now as it is not currently possible. It makes greater sense to focus on achievable goals to defuse tensions, such as an agreement to freeze North Korea’s nuclear and missile testing in exchange for an adjustment in US-ROK military exercises. If these initial talks are productive, it could open the way for other issues to be discussed, such as securing assurances from the DPRK that it will not transfer nuclear weapons and related technologies to other countries or groups. We must pursue every diplomatic option available to avert the possibility of a nuclear war with a regime that believes it is in survival mode. The longer we delude ourselves that there is a viable military option, the longer the current course of escalation will intensify — and the greater the chances of spiraling into military conflict, either by design or by miscalculation. The question “What is the best way to deal with North Korea?” assumes implicitly that current Korean Peninsula tensions mainly come from the provocative behavior of DPRK. I would like to reformulate the question this way: “What could be a way out of the current security dilemma in the Korean Peninsula?” and discuss several prerequisites about the problem. We need to take all relevant actors’ security concerns into consideration. First of all, we need to stabilize the situation by avoiding provocative policy from all sides. This means the DPRK should stop nuclear and missile tests and the US and ROK should stop military exercises and desist in provoking rhetorical competition. Second, regime change should not be the policy choice with which to attempt to solve the Korean Peninsula problem. It is very natural to blame the situation on a certain political leader. But removing that leader from power might not necessarily lead to peace and stability. On the contrary: in many cases, such course of action has led to other undesirable situations. Third, the role of economic sanctions on DPRK should not be exaggerated and the resilience of the DPRK regime should not be underestimated. The DPRK government has survived for over a decade under the UNSC’s economic sanctions. What is the best way to deal with North Korea? I think the relevant countries should take the DPRK’s security concerns into consideration, open dialogue channels based on mutual respect, and gradually denuclearize the DPRK and build multilateral security mechanisms in northeast Asia. North Korea is well on its way towards developing fully deliverable nuclear weapons capable of hitting the United States, China, Japan, South Korea, and many other potential targets. This represents a grave threat to the Asia-Pacific region. North Korea’s continued advance signifies both the failure of past efforts to prevent full nuclear weaponization and the spectacular insanity of the Trump administration’s North Korea policy to date. In spite of President Trump’s aggressive tweets and unbalanced talk, his and his administration’s words and actions to date have only decimated US leverage, undermined America’s relations with key allies like Japan and South Korea, strengthened North Korea, and gifted China multiple concessions in exchange for little help in pressuring Pyongyang. The only way North Korea will give up its nuclear weapons is if its leaders come to believe they are safer without those weapons than with them. Because China is the only actor that can increase the cost to North Korea of nuclear weaponization by threatening to cut off energy resources and trade, Beijing would need to feel it is better served by North Korean regime change or Korean reunification than by the existence of a nuclear-armed and hostile North Korea if it is to pressure North Korea enough to drive change. The most and perhaps only logical approach to the North Korea crisis, therefore, would be to increase the cost to China of maintaining the status quo while constructing a robust containment strategy for North Korea. As with the Soviet Union during the Cold War, this type of containment strategy would not at all preclude negotiations. The optimal strategy for facing North Korea is containment. 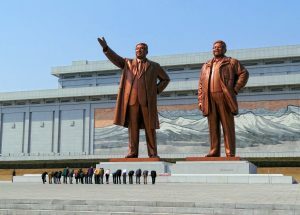 North Korea is essentially a failed economy with an oppressive state that has achieved nuclear capability. This is a highly unstable combination. North Korea’s imminent demise has been predicted for the past 25 years. That the regime has survived certainly shows that its detractors have greatly underestimated it, but the persistence of talk of collapse also shows the inherent instability of the regime. The international community should target North Korea’s strategic weak spot, its economy, rather than play to North Korea’s strength, which is military confrontation. Any containment strategy against North Korea will have two characteristics. First, it will involve China, which is aware of the North Korean risk yet ambivalent about containing it. Second, it will have to be in place for the long run, as economic sanctions take time to take effect. These two attributes imply that acknowledging China’s strategic interests is critical in ensuring its long-term cooperation. And strengthening sanctions will have to be a gradual process, with the flexibility to adjust measures in response to North Korean behavior. Once China and the international community agree on the common path towards the shared goal of North Korea’s denuclearization, the end will begin for North Korea. Prior to engaging any new approach towards North Korea, one must consider the different options experienced in the past 25 years, from dialogue and deal to deterrence and sanctions. This large range of options, particularly addressed by three US administrations, seems to have failed, as Pyongyang has maintained not only its nuclear program but also its posture, to say nothing of the absence of any political change. The failure of the sanctions regime is striking: various levels of sanctions (multilateral, international, national) and types of sanctions (economic, military, political) have produced no results. On the contrary: North Korea has boosted its program in response to the sanctions.